The memorial service will be at 11:00 AM on June 9th at the Shining Light Church of Laurium. Visitation will be for an hour before the service at the church. The Pearce Funeral Home is assisting the family with the arrangements. 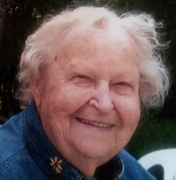 Calumet: Arbutus Bleise, 91, went home to her Lord and Savior on April 13, 2018. She passed away at Houghton County Medical Care Facility where she had been a resident since February 2017. She was born on July 4, 1926 to Edward and Olga Willmers in Laurium, Michigan. Arbutus attended Dollar Bay Schools and graduated from Suomi College. Arbutus was employed as an Avon saleswomen in the Lake Linden-Hubbell area, a Michigan Tech Nursery School teacher, and a Head Start Teacher in Lake Linden and Centennial Heights. Arbutus married Joseph Bleise on June 21, 1946. They resided in Hubbell as well as in Oneco where they pursued and enjoyed their love of gardening and hobby farming. They were blessed with six children; the oldest, Michael (Pipes), was a special need’s son. Arbutus was relentless in seeking services for special education children in the Copper Country so that her Michael could be at home with the family. As a loving, dedicated mother, Arbutus engaged her children in numerous learning activities[FD1] where she often was a leader. She was a Sunday School teacher, a 4-H leader, a Horse Club Leader. As a homemaker, she insured her children knew how to cook, bake, sew and clean before leaving home. Arbutus is remembered for her baking and flower gardening. She was passionate about flowers, creating flower beds that bloomed throughout the seasons so that she could entertain friend and the lunch bunch from Dollar Bay and Hubbell, Special Education classes and Head Start classes for garden viewing. Arbutus is preceded in death by her husband, Joseph; two sons, Michael and Jerome; her parents, Edward and Olga; and a sister, Helene. She is survived by two sisters, Jean Carey of Midland, Michigan and Bettie Gromaski of Auburn, Michigan; two sons, William (Bonnie) of Shephard, Michigan and Richard (Cindy) of Calumet, Michigan; two daughters, Faye (Robert)DeMarte of Eagle River, Wisconsin and JoAnn DeMarte-Weiss (Donald) of Ahmeek, Michigan; 9 grandchildren and 3 great grandchildren, and numerous nieces and nephews. Her family would like to thank the staff of Keweenaw Home Nursing and the Houghton County Medical Care Facility and her personal doctor, Dr. Lee for the love and care they gave to Arbutus. A memorial service will be held on June 9th at 11 o’clock at the Shining Light Church of Laurium. The Pearce Funeral Home is assisting the family with the arrangements.